« US stops Singapore Judges COLD! 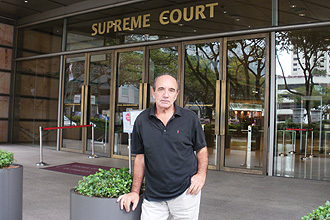 British author, Alan Shadrake, 75, has been arrested in Singapore because his book, Once a Jolly Hangman – Singapore Justice in the Dock, exposed the unfairness of Singapore’s death penalty. The 219-page book is filled with accounts of high-profile cases in Singapore involving the death penalty and includes interviews with the country’s former executioner Darshan Singh. Mr. Shadrake, who divides his time between Britain and Malaysia, was in Singapore last Saturday for a private book launch at the Post Museum in Little India. He was arrested by the police at his hotel at 8.20am the next day. Mr. Shadrake is being investigated for the alleged offense of criminal defamation. This crime in Singapore carries a sentence of up to two years in prison plus unlimited fines. Mr. Shadrake’s book covers Singapore capital punishment cases from the early 1990s to the recent past. Many of these cases ended with the accused meeting Darshan Singh, Singapore’s hangman for the last half-century. The book demonstrates that the application of capital punishment in Singapore is not a matter of justice. The decision as to whether someone is to be hanged is really a political one: the government, not the court, determines who can be hanged and who cannot be hanged. In Singapore there are no trials by jury, so the judge is free to take orders from the government and to impose the sentence accordingly. Among other cases, Mr. Shadrake’s book recounts that, in October 2004, sixteen Singaporeans and seven foreigners were arrested and faced charges ranging from consumption to dealing. One of those accused was Dinesh Bhatia, the son of former judicial commissioner Amarjeet Singh. 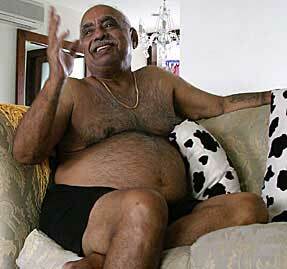 Bhatia faced 10 years behind bars for consumption. His defense lawyer, K. Shanmugam (now the Minister for Law) stated at trial that Bhatia did not know it was cocaine that he was snorting. In the end, after appeal, Bhatia’s sentence was reduced to eight months, but less than three months after that, he was reported by the Straits Times to be at home, albeit wearing an electronic tag. The drug supplier to Bhatia and the others was Ben Laroussi, himself a high-ranking executive. Laroussi was arrested on the capital charge of trafficking, but when the drugs were tested a second time, the quantity he diminished miraculously below the mandatory hanging threshold. This tactic of “short weighing” is frequently used by the Singapore police to save the favored few from the hangman’s noose. Laroussi was given bail on his own recognition, upon which he disappeared from Singapore. Our book, Escape from Paradise, was also banned in Singapore. We, however, did not make the mistake of getting caught in Singapore, or we would have been arrested like Mr. Shadrake. In spite of the ban on Escape from Paradise, it still sells quite well in Singapore through Amazon. In Singapore, a mere 15 grams of heroin, 500 grams of cannabis, 30 grams of cocaine, or 250 grams of methamphetamine will get you the hangman’s noose. There are no jury trials in Singapore, as juries had been abolished by Lee Kuan Yew. The bulk business of drug distribution is not done by small-time couriers, but by the big boys, who never touch the drugs, and are never touched by them.